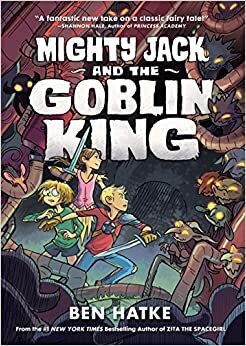 I am a huge fan of Ben Hatke, and this second book in his Jack series — Mighty Jack and the Goblin King — has only deepened my appreciation for his talents as a storyteller and artists. Hatke has taken the Jack and the Beanstalk into strange, new territory here, and I love that the story splinters and then comes back together in a way you might not suspect. He always has strong female characters, too. Mighty Jack’s story is not over, and the end of the novel brings another movie-like twist, reminding my son and I of another Hatke character that drew us into his world many years ago: Zita the Spacegirl (another series you should read). The Jack series is a solid read for elementary students, but middle school readers would probably enjoy it, too.